Solaris' built-in IQ Visionary projector displays stitches and embroidery designs directly on the fabric. Resize, move or make other adjustments with the touch of a wireless stylus - all while seeing it happen in real time before you sew it out. Perfect placement is achieved every time. Baby Lock's largest hoop makes it possible to stitch out your biggest embroidery designs with fewer rehoopings. 10 5/8" x 16" hoop size. 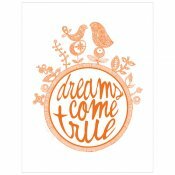 IQ Designer - Creative your own designs and quilt motifs with ease. Draw directly on the screen, scan in your favorite line art or upload an existing file to the Solaris. Your art will be instantly digitized! 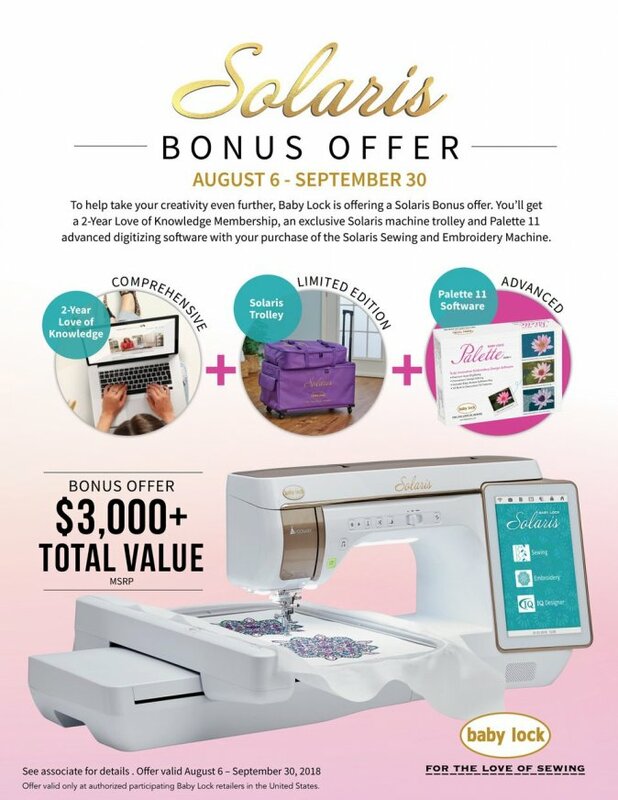 Enhanced Editing - The Solaris features processing speed that's 30% faster than previous Baby Lock sewing and embroidery machines. It processes your edits, combines your designs and even imports them faster than ever. You can even save them in the built-in memory for future use. 740 Built in designs - 861 decorative stitches - 30 decorative fills - 151 utility stitches. Auto Split of Large Quilting, Border and Corner Designs. Create beautiful borders and sashing with unmatched precision. Simply put in your dimensions and Solaris does the necessary measurements for you. It matches the corners then calculates the middle for a complete frame. Echo Quilting and Stippling Lines. Camera Detecting Buttonhole feet. Solaris' camera automatically senses pre-set points on the buttonhole foot, providing an accurate, better sew out. The two-piece foot secures the fabric, preventing slippage. 13 in. to the right of the needle. Needle Plate with Push Button Release. The needle plate also features a variety of markings for better placement, alignment and accuracy. Dual Spool Stands. This multipurpose stand conveniently sits in the top cover. It's perfect to use with twin needles for decorative stitches. For Embroidery projects, set up both threads at the same time and quickly change from color to color. It also holds and supports larger cones for your quilting projects. Enhanced Stadium Lighting. Eight high-powered color rendering LEDs illuminate your project so you can see every detail - including your large embroidery designs. Love of Sewing membership - Get access to more than 400 on-line classes taught by 25 baby lock experts. Soloaris Extension Table - The tables convenient design stores your knee lift underneath. Pallete 11 Software - This revolutionary design software works perfectly with Solaris to wirelessly transmit designs from your computer and introduces new techniques, options, and styles. You'll enjoy improved functionality that makes every stop of digitizing easier. Solairis Foot Kit - 30 piece foot and accessory kit. Solaris Trolley - Stores and transports all of your hoops - including the 10 5/8 x 16 inch hoop. I hope you have enjoyed this brief over-view of the new Baby Lock machine. We will be scheduling demo's of this new machine as soon as it arrives in the store. 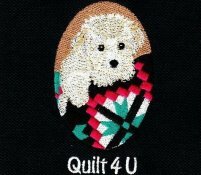 If you would like to be added to the list, please e-mail us at info@quilt4u.com. Demo's will be scheduled in the order received. This is the machine of your dreams!